Donique Anderson collects her certificate from Grade Supervisor, Mr. McIntosh, at her high school graduation. The determination to persevere when caught face to face with adversity builds character, and there’s none other than Trelawny’s Donique Anderson who can vouch for that at this very moment. At just 22 years old, Anderson was the only female of the 196 constables to graduate from her batch – Batch 119 – at the National Police College of Jamaica at Twickenham Park in Spanish Town on Wednesday (January 30). She also obtained the highest overall score from her batch. Two years ago, however, as soon as her pursuit of becoming a police officer took off, she was struck by an illness that seemed intent on wiping out her dreams in one blow. After being tested for jaundice and leptospirosis, it was later discovered that she suffered from Autoimmune Hepatitis. With this, her liver was swollen and not functioning properly. She underwent a series of unbearable stomach pains and a swollen belly which, on February 29, 2017, forced her to discontinue training and seek medical attention. As a result, Anderson was hospitalized for six weeks at the Falmouth Public Hospital. Anderson admits that on some occasions when her mother would visit her in hospital, nothing would be said between the two, but they understood and shared the pain in silence. 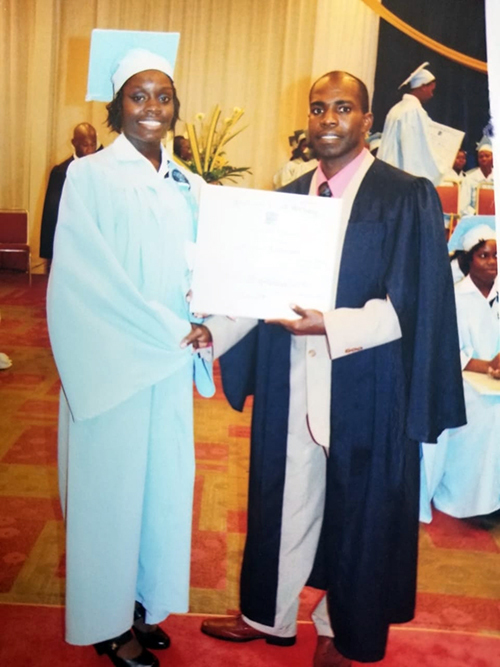 From Deeside in Trelawny, the former Holland High student revealed that she signed up to join the Jamaica Constabulary Force (JCF) nearing the end of high school. “I felt very lucky when I got accepted almost immediately after applying because I’ve heard stories of persons applying and having to wait for years before they get accepted,” she said. Owing to the encouragement and support of her family members, especially her mother and friends that rallied behind her when she needed hope, Anderson studied endlessly while hospital-ridden. “I’m self-motivated, but the encouragement from my mom, family and friends really helped to keep me grounded. I studied a lot while in hospital. My training officer, Inspector Barbara Robinson, and the Deputy Commander for training, Deputy Superintendent Annette Duncan, have always been there for me as well,” she said. “I really wanted to make a difference with my life. Where I’m from in Deeside there’s not a lot of individuals doing things meaningful. I didn’t want to be one of the young people on the road not being productive,” she said. As for her career, Anderson hopes that where she is placed, she will have a positive impact on every position she may hold in the future. With nine (9) CSEC subjects under her belt, Anderson hopes to pursue a career in Journalism sometime in the future but for now, her focus is on protecting the innocent and serving her country.